And I just can't stop making these. I now prep them in groups of five. Some weeks all five get done, some times I go weeks before I get any done. Either way is fine by me. Quite a bit of progress from those first nine! Last week I decided to throw some yellow into the mix. I felt like the blocks needed a bit of pop. I wasn't sure at first, but now I really like it. In truth, it now reflects one of my favourite fabrics ever, Motif Madness from Tsuru by Rashida Coleman Hale for Cloud 9. Hmm, I wonder if I could get my hands on more for the backing? I'm at the point now where I am almost out of the options I've got in my stash for blocks. I am trying to make no two blocks alike. Not a perfect charm quilt, as some backgrounds may get used more than once, but as close as I can get. So now I am putting out a call for help. I've got enough yellows to tackle those blocks. I'm not picky about modern vs traditional fabrics, loving them all. But I do know that batiks are no good for the needle turn appliqué that I am doing. If you are keen on sharing a bit of your fabrics with me, let me know and I will send you my mailing address. I would appreciate it so much! So would this quilt. It wants more variety, it keeps telling me that. Hi Cheryl. I'll send you some from sunny California. I remember it cost me a fair bit to send you one slab block for your donation quilts but i think it was because of the way I packaged it. I'll try mailing in a regular envelope and see what happens. I have some coral and teals in my stash which I imagine are the hardest to get from others. would love an update on the post-floor slab quilts... unless I've missed one. What an enormous task you took on, though I think other local quilters had stepped up to help you assemble, if I am remembering correctly. Kudos to you! Oh, I will cut my fabrics a bit larger than 5.5" and then you can opt to use them all as backgrounds if you like. I do need your address though. Liz, send me an email directly as you are a no reply commenter. I think that they should fit just fine in a regular envelope and not make for any additional weight over a standard letter. For anyone wondering, I was able to put 5 6x6" fabric bits into a letter sized envelope and on our small postal scale it weighed in at 0.9 oz. So one stamp should do! can you define the coral and teal by way of a kona color card? I think those are subject to interpretation... I've probably got some I can send! I would love to send you some fabrics. Please provide your address! Thanks. I would love to share too. I have some coral and some bits you might want and I would be happy to send them to you! Happy to send you some - just send me your address. It's gorgeous - how big you planning on making it? There are a few of you that are No Reply Commenters. If you haven't heard back from me, I'm not being rude. I just have no way of getting a hold of you. Hi again, Cheryl. This message should provide you with my email so you can send me your address. Thank you! I'd love to contribute! Lord knows I've got enough fabric for a small village of quilters. Why don't you just support your local quilt shop or online store and buy what you want...just wondering. Sorry, I guess I don't get it. I just wanted to respond to Sandra W. You make a valid point. Indeed, I've been shopping at no less than 3 local stores to augment my fabric for this project. I am blessed with a number of stores close by, all run by fantastic people. And I do shop at them first. But we all know that every store can't offer all the fabrics. right now I've bought every coral I can find and am making my way through the navy and teals. This call was a hope to add more variety to the quilt. And frankly, I appreciate the care someone else takes into contributing as well. It is rather fun to know there are bits from other people's stashes gracing the finished quilt. More love shared. i'd be happy to send some along! fun! "This call was a hope to add more variety to the quilt. And frankly, I appreciate the care someone else takes into contributing as well. It is rather fun to know there are bits from other people's stashes gracing the finished quilt. More love shared." This is exactly how I feel Cheryl. 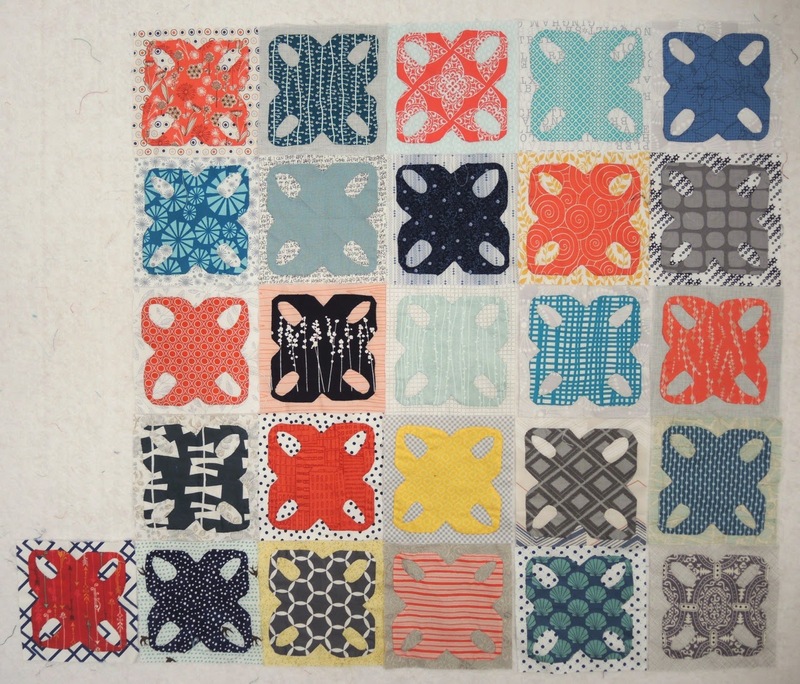 For me, it will be cool to know that I was able to help you add variety to your quilt. It IS fun to share! And with all you've done for others, it is especially fun to share with people like you! I'll send a couple of fabrics along with Kate next week! Hi Cheryl - I culled a nice bit for you. It may go in the mail before next week! Thanks for the opportunity to be a part of your project. I am not surprised that you can't stop making these. They look amazing. I hope you're starting to receive some fun packages Cheryl! Mine should be arriving soon. I love how the colors are developing! Would you still like to receive some additional fabrics?